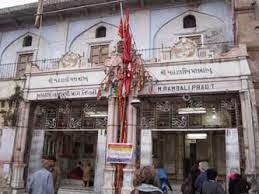 Here is Some information about Bhadrakali Temple in Ahmedabad Gujarat India. Location: Jijabai Marg,Bhadra Fort,Lal Darvaja ,Ahmedabad. Significance: One of the most temple in Ahmedabad. Nearest Railway Station:Ahmedabad Kalupur station. 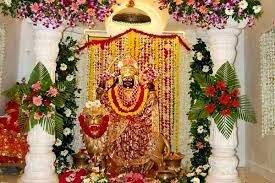 Goddesh Bhadrakali Temple is located at Jijabai Marg ,Bhadra fort,lal Darvaja in Ahmedabad.There are only 4 Bhadrakali temple in india.among them one of the temple which one.The Bhadrakali Temple of Ahmedabad was constructed during the rule of Aazam Khan. The Bhadrakali Temple in Ahmedabad was believed to be built by the Marathas in the medieval India. The Bhadrakali Temple in Ahmedabad was believed to be built by the Marathas in the medieval India.Goddess Bhadrakali is worshiped by its devotee to acquire prosperity and wealth. Being one of the cogent deity in Hindu pantheon, the Bhadrakali Temple at Ahmedabad is visited by hordes of devout from across the country throughout the year. The goddess is worshiped during famous Navaratri Festival which is also the main festival celebrated here with nine days of roars, cheers, dances and colourful outfits. This song and dance festival is the best time to visit this temple as you can dance to the tunes of traditional music, eat hearty food and enjoy to your fullest. Ahmedabad Bhadrakali Temple is worth visiting during this festival of song and dance. You will enjoy by dancing to the tunes of traditional music or eat hearty food if you visit the Bhadrakali Temple Ahmedabad during this time. The goddess of the Bhadrakali Temple at Ahmedabad is worshiped during the famous Navaratri Festival in Ahmedabad. During the Navaratri Festival, which is considered as the major festival of the city, the Bhadrakali Temple is thoroughly decorated. The nine days festival is celebrated with great pomp and show in the temple premises. During this period, the Bhadrakali Temple witnesses thousands of tourists thronging in the Bhadrakali Temple to worship, dance in colorful outfits and enjoy the festival. Ahmedabad Bhadrakali Temple is worth visiting during this festival of song and dance. You will enjoy by dancing to the tunes of traditional music or eat hearty food if you visit the Bhadrakali Temple of Ahmedabad during this time. The Bhadrakali Temple of Ahmedabad lies very near to the beautiful Azamkhan Palace and a beautiful garden. The Bhadrakali Temple is one of the oldest temples of the city that still survived the ravages of time. The temple is as old as the city of Ahmedabad. The name of Bhadrakali Temple was given after the dedicated to Goddess Bhadrakali Mata. 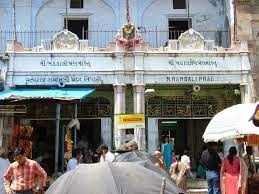 Bhadrakali Maa Temple is Located inside Jijabai Marg,Bhadra Fort, Near Lal Darwaja, in the Ahmedabad city, Gujarat. The Bhadra fort once encompassed Approximately 12 gates, 189 bastions and 6000 battlements. The Bhadrakali Temple In Ahmedabad was constructed during the rule of Aazam Khan. 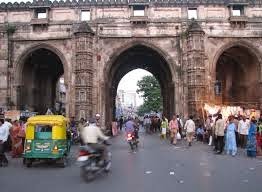 The Bhadrakali Temple in Ahmedabad was believed to be built by the Marathas in the medieval India.Goddess Bhadrakali is worshiped by its devotee to acquire prosperity and wealth. Being one of the cogent deity in Hindu pantheon, the Bhadrakali Temple at Ahmedabad is visited by hordes of devout from across the country throughout the year. By Rail: Ahmedabad has 3 Railway station one of Vatva,Maninagar and kalupur.The Kalupur Railway station is neatest station of Bhadrakali temple in ahmedabad. By Air: The Nearest International Airport(10 Km) from Bhadrakali Temple.